Once viewed as a boardroom activity among executives to fill top leadership positions, succession planning has evolved into a powerful tool focused on proactive — and ongoing — assessment, promotion, and retention of key performers throughout the business. And the benefits are huge: higher performance, improved morale, and a boost to the bottom line. While company-wide succession planning and ongoing talent reviews are key to developing employees and maximising the workforce, it is not uncommon for businesses to struggle with this concept in the corporate culture, and more importantly, with the implementation. 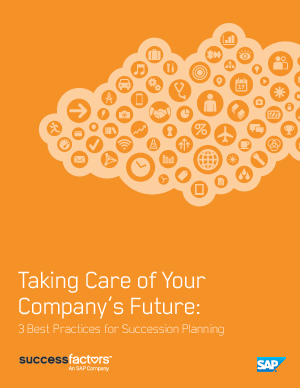 This eGuide addresses these issues and provides a roadmap to make a succession planning strategy successful. • Why is succession planning such a hot topic today? • What succession planning can do for your business. • Self-assessment: what to ask when starting the succession planning process. • Three best practices for succession planning.